Luang Prabang takes time to grow on your mind. And once the sapling has grown inside, it will take forever to uproot her memories and plant it to a new destination. 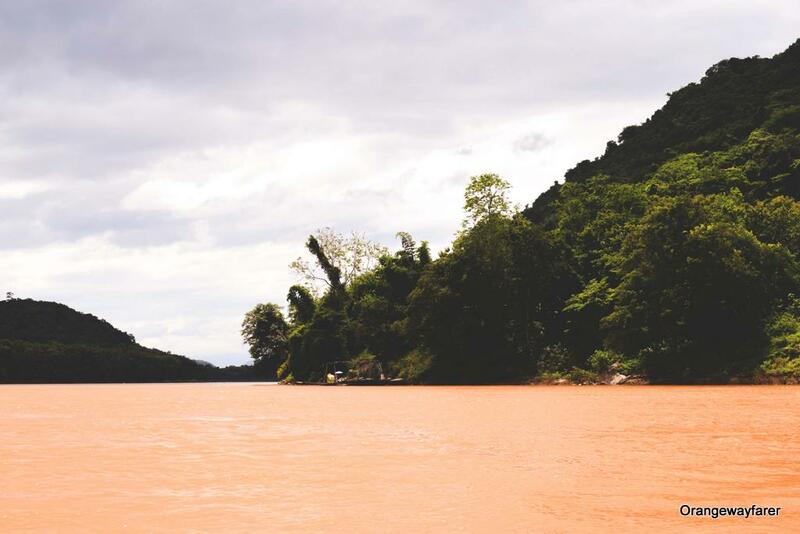 The landlocked country of Laos has experienced the Mekong turn into a monstrous river and flood the vast rice fields. History has taught this flood is only an onslaught of a prolonged fertile season. Laotians families will dawn the conical hats and busy themselves at the field. Unlike the neighboring countries, holding the crowning glory of the quintessential Asian destination, Laos is yet to experience an influx of tourism crazy frenzy. Not every temple is frequented with selfie crazy tourist (yet). The ruins of ancient temples, the remnants of the fierce America war on Vietnam, the real authentic life of local is a live scene everywhere. Yet, I knew hardly any of them! In my mind, Luang Prabang was the end destination of the “slow riverboat tour” that starts from Chiang Mai, Thailand and floats on the Mekong! The good news is, I know better now! The land of Million Elephants, and a few Dragons! Luang Prabang had historically been the seat of culture and Buddist tradition of Laos. The Chinese influence on Buddhism is immensely noted in the region. Buddhism becomes saturated with many mythical creatures, folklores come to enrich them. 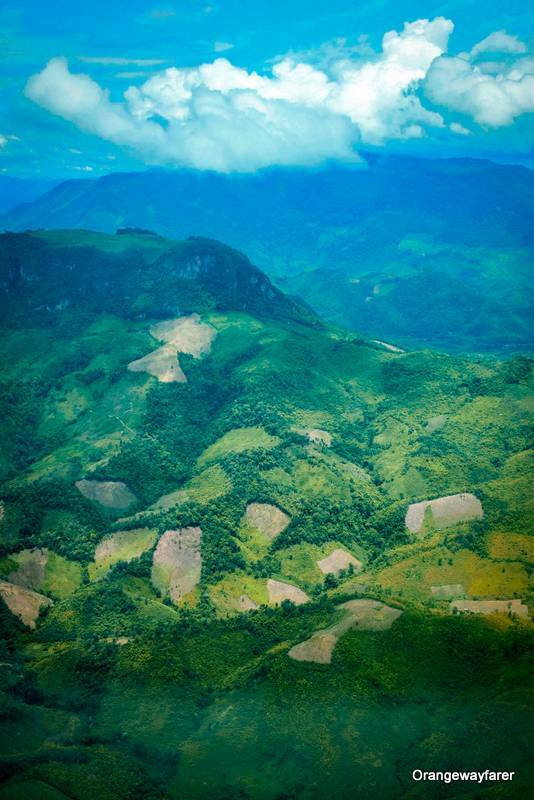 The mountains surrounding the regal seat of Luang Prabang becomes quintessential dragons! they live, breath, make merry with the countrymen, as well protect them from enemy unforeseen in trying times! Also read, 25 beautiful photos of Luang Prabang timelessness! If you want to touch the soul of Southeast Asia, you need to understand the whim and fancy of the river Mekong! I was intrigued by the river ever since I watched this movie, Apocalypse Now! To have had the sheer luck to row a boat on the Mekong, the sacrilegious river by Buddha is beyond worldly expressions! Even though I have lived by Saigon for a few days, the Mekong in Laos is different. She is pretty and orange. She is in her vibrant youth. Her flow is punctuated with the hillocks decked up in dense lush forest and limestone creeks. Many tribes live in those jungles completely cut off from a world, often described as the global village! They will touch you, pull a few strands of your hair and be overwhelmed if you happen to cross many intangible boundaries and reach that part of the world, I was told! I am from India. To be more specific, I am from Kolkata where the chief minister makes it to her political agenda that one day Kolkata will become London! 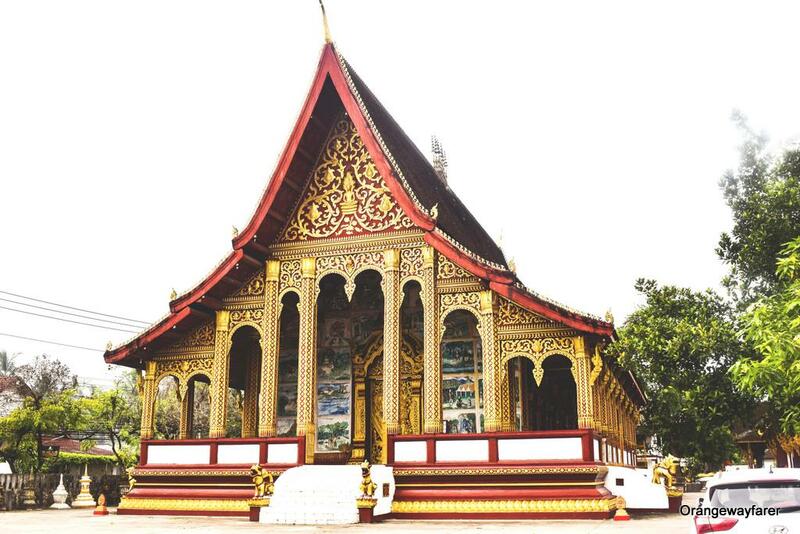 I completely understand the efforts Luang Prabang puts in place for preserving the colonial heritage. 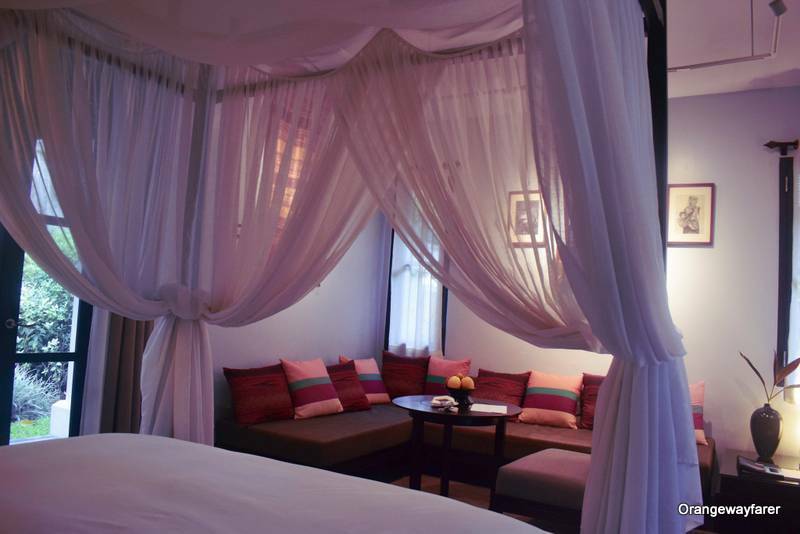 From the street vendor’s baguette to Sofitel’s elaborate duvet, Luang Prabang clings to the french memory in a forlorn romance! I can literally kill for that piece of bread! If that is a tad bit overhyped, I can at least wake up early for a hearty breakfast! For the love of Rice, umm, sticky rice! Laotians love their rice. 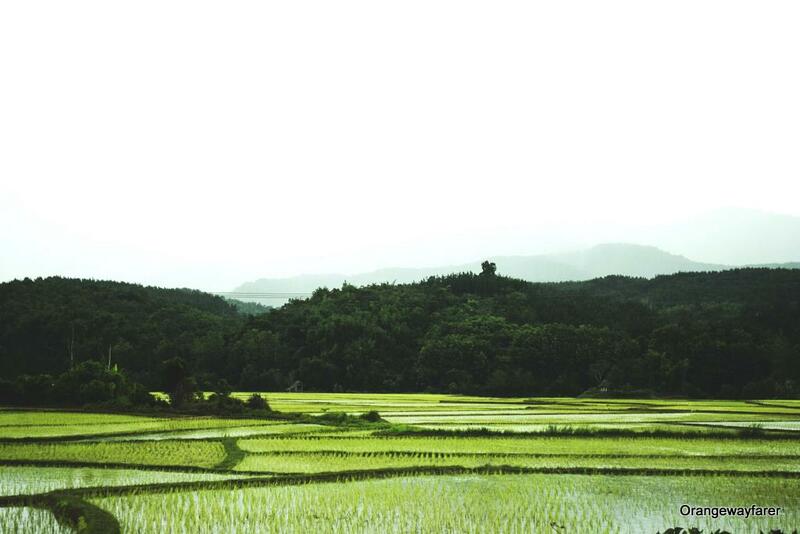 The vast land at the foothill of the mountains is adorned with paddy fields. It is quite a sight to see the endless Kochi Kolapata green, especially at the advent of the monsoon! Rice farming is a family affair in Laotian families. Children come back happily from school and take part in the yield. Not much of a surprise why the Bengali in me was elated looking at the staple food and the field! I remember telling a friend about how Bardhaman, also known as West Bengal’s rice bowl, resembles the same during monsoon, sans the mountain silhouette! 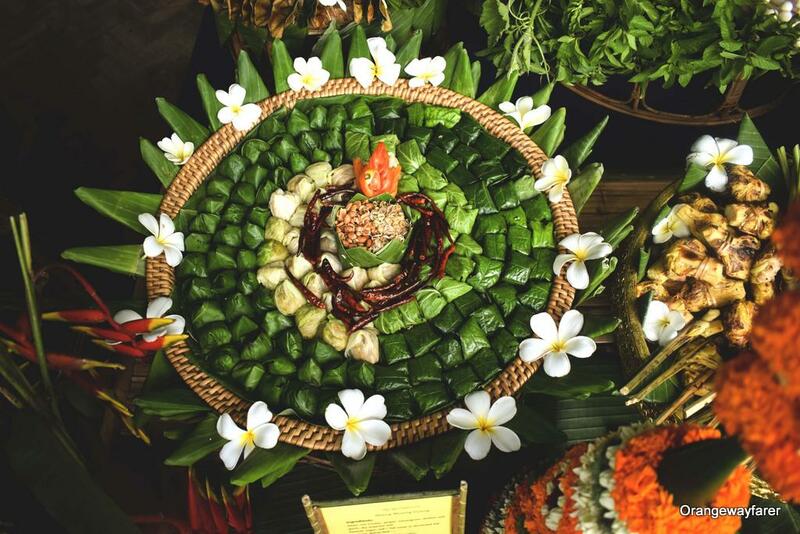 How pretty the traditional Laotian meal looks like? Also, a meal is a communal affair in local Laos households. they are often decked up on a cane basket and served on a low height bamboo stool. I especially loved the use of Kath Golap flower, also known as Frangipani and Luang Prabang’s synonym! Templed-Out! That is a real thing! If you are coming from Bangkok and have spent a few days to explore the city’s riverside temples, you may not trust Luang Prabang with anything new. And once you reach, you will know you have never been more wrong! Temples in Luang Prabang are as beautiful as Benarasi sarees if I have to compare or take a reference to elaborate the beautiful architectures! The enamoring usage of golden hue on a bed of rust red against a backdrop of the azure sky is overwhelming. The Laos Coffee! A beautiful beautiful Surprise! 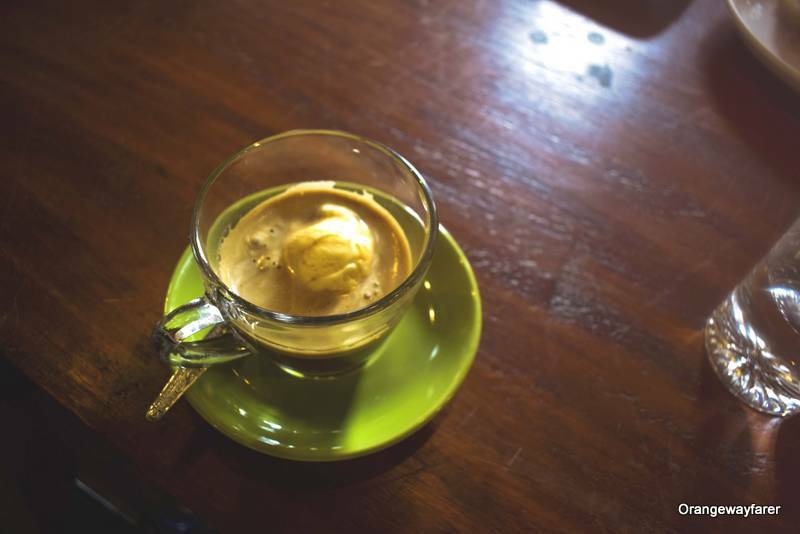 While the neighbor country Vietnam has attracted lion’s share of the media and discerning taste of coffee connoisseurs, Laos has secretly made a revolution in its coffee production! saffron cafe by the Mekong river will be my choice for the best organic coffee in the town! 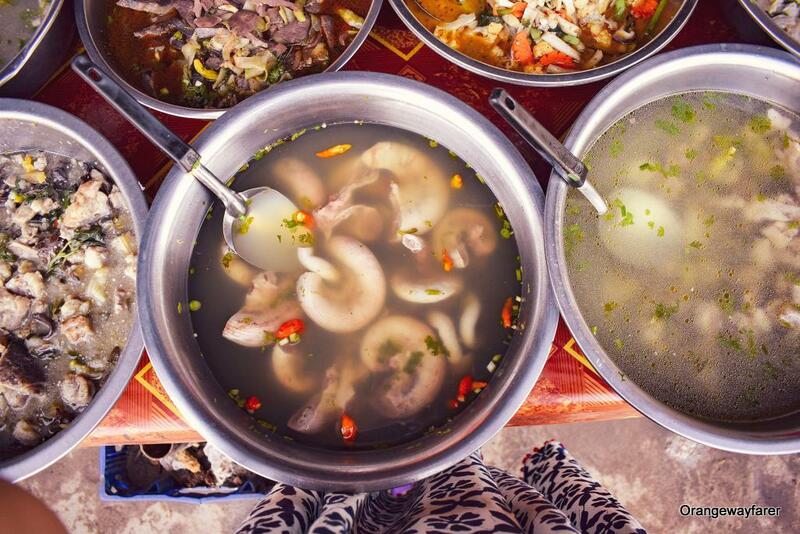 The Lao food: a Meaty affair! Since I was invited on a FAm trip by the Laos Tourism Board, I had the good fortune to taste the real local food and not just grilled meat and fish! And, I was amazed, truth be told. It is nothing like the Thai or Vietnamese variants of Asian cuisine! Meat is used in abundance and steamed or preserved for future with natural techniques. a blessing for staying away from technology, I believe! Buffalo meat is used in abundance in Laos cuisine. I must mention the dried buffalo skinthat is cooked with spice wood. I think I need to elaborate that story another time! Nature’s wonders: the TRUE hidden gems! I had the regret of discovering Phi Phi island, all infested with humans! Humans and boats, to be more specific. The day trippers and death of a pristine bay! Kuang Si, with her ethereal beauty in each step is a pleasant surprise hidden behind the tall old trees. 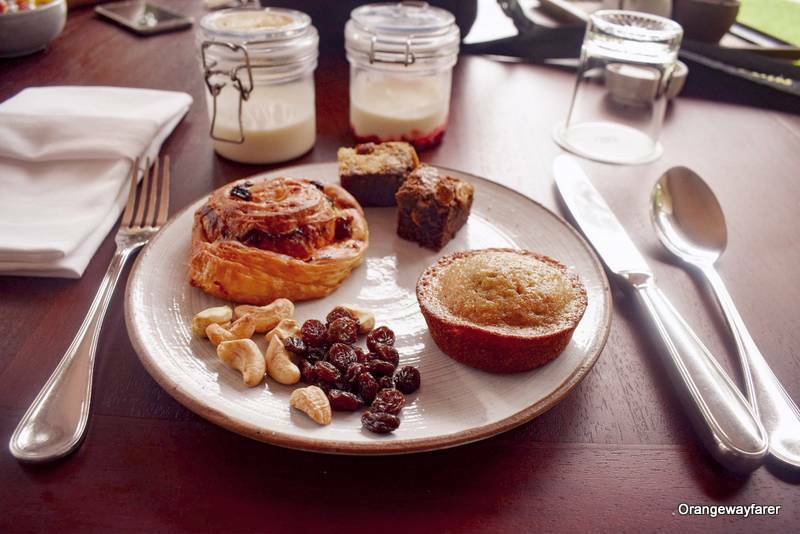 It is made with care and love, by the nature and every detail has been taken care of! 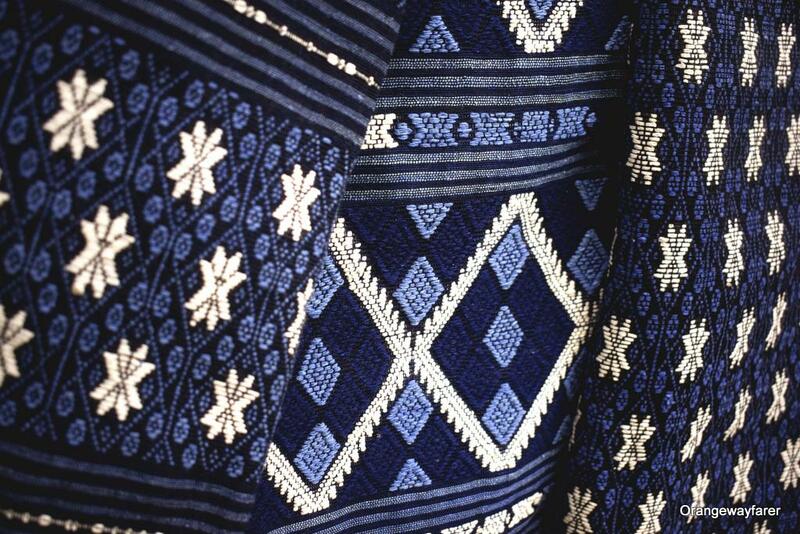 Hues of Indigo: A village of the Weavers! On a fine morning, we drove to this nearby village of weavers! The villagers tied knots on our hands from the Baci ceremony and welcomed us with a piece of handwoven scarf. I am a Saree lover and claim to understand a bit of weaving! The skill villagers had implemented in their weaving style astounded me! Every house had their own style of weaving and colors. The procurement is organic in true form and production is slow but arty! 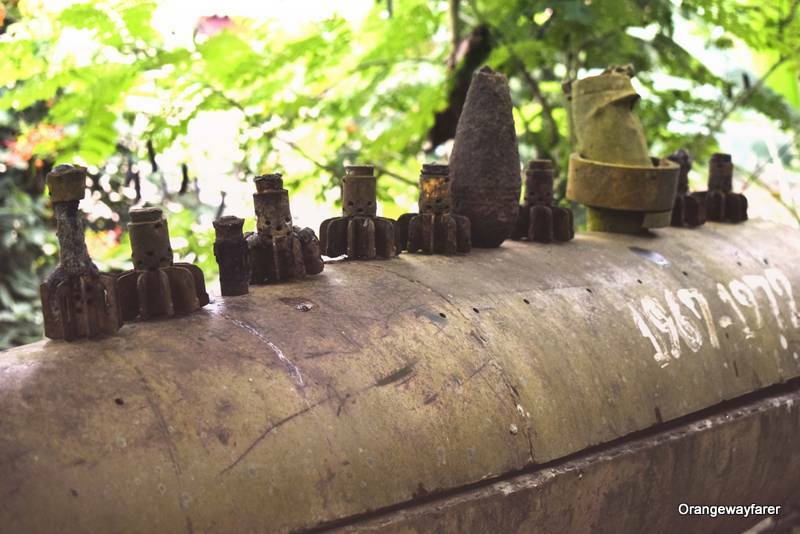 A War that Laos Remembers! The year 2018 had had former US president Obama visiting Laos PDR and promising a lumpsum donation to help detonate the unexploded bombs from the American war on Vietnam from the 1970s. The rural parts of the country had been bombed mercilessly and remain the most bombed part of the world! Some of the households have had bombshells discovered from the courtyard and dismantled and used them further for household supplies! Such a poetic justice to a ruthless weapon of terror! 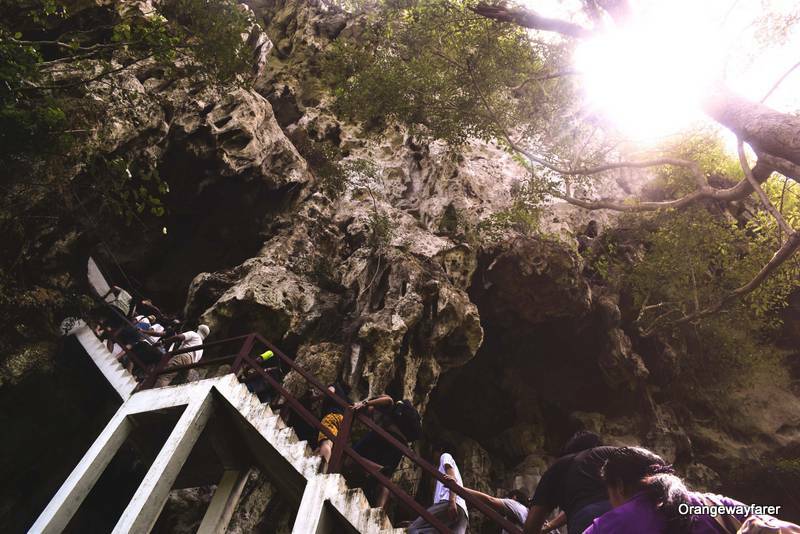 Entrance to the caves of Pathet Lao. A turbulent time when governance was conducted from this cave! The Night Markets of Luang Prabang! Luang Prabang has plenty of markets. The morning one is used and frequented by the locals and the night one is touristy. For the virtue of being touristy, the latter also comes with showcasing some of the best talents of the region. 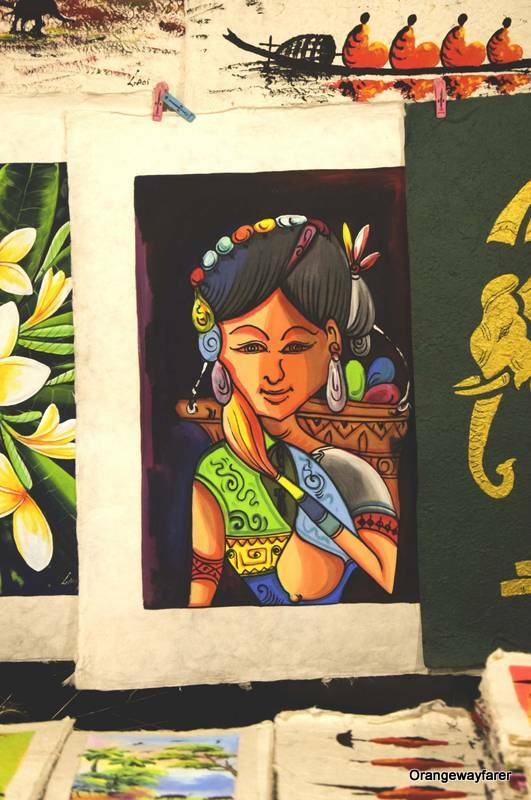 The hand paintings, the hand-woven fabrics and scorpion infused wines are surely a treat for the eyes! Want to book a stay for the next vacay? Great post! Laos looks so rich in culture and a beautiful country. We didn’t make it there on our last SE Asia trip but definitely will next time. I’ve heard the Lao food and the night market is amazing! I’m trying to go next year! Loved your post! 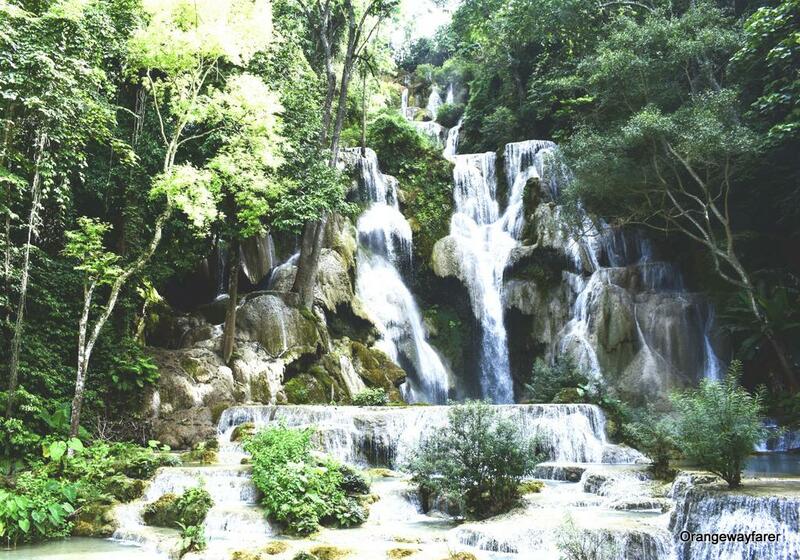 Laos looks beautiful and I would love to visit. It’s nice they have embraced their french heritage. The temples and the nature look beautiful too. And I am sure i would love the food. Luang Prabang is so pretty! It was my favourite place in Laos by far… and yes… the night markets are awesome! Brilliantly elaborated. Congrats. I have different perspective on Luang Prabang. Appreciate your reading.. I love this! Beautiful photos from a magical place. I’ll be in Laos in December and will take some tips from your itinerary. I am kind of secretly glad that tourism has not spoiled the beauty and sanctity of Luang Prabang and hope that in future it doesn’t fall prey to over tourism. Lovely article and gorgeous pictures.